Anniversaries come on top of the dates-to-remember lists. And it becomes even more critical if it is a wedding anniversary. Giving gifts shows the clear appreciation of the person and the importance of the event. However, choosing a gift is not always an easy task! To make it more enjoyable, people used theme lists for marriage anniversaries in order to add humour to the gifting process. For the 16th year anniversary, the traditional approach is wax gifts; and the modern choice is silver holloware. That’s a good starting point, nevertheless, still there is a lot of work to do before reaching to the final decision. Luckily, we made a lovely list to help you out! The most variety for a 16th year anniversary wax gift will be found in; you guessed it, candles! There is a gazillion of candle types to choose from: plenty of colors, fancy designs and many odors. No doubt, you will find what you have in mind. Even so, never forget to go the extra mile and customize your candle for that special person. You may deliver your gift in a personalized box, or maybe you’d like to have your initials on the candles. Another option if you want to go with wax gifts might be a set of wax letter seal. In the time of emails and instant messages, taking the time to write a letter on paper and sending it is really rare. A wax seal set might be a fantastic gift for such a person with exquisite taste and elegance. Think of a wooden box and inside a wax badge seal set with initials of that special person. Now that’s an unforgettable elegant gift! The modern option for the 16th year anniversary, is silver holloware. It offers a wider selection of gifts to choose from. Silver holloware is also easier to get with. Silver pens, tie pins, jewelry or silver jewelry boxes come to mind in a snap, but silver holloware opens a whole new world of selection. Moreover, personalization and creating a unique silver gift is very easy. Before going deeper, let’s first understand firmly the fundamentals. Silver holloware refers to every silver object, which includes or covers a void space in its design. Coffee pots and sugar bowls are perfect examples for holloware. This obviously leaves out all tableware such as plates and serving pieces. 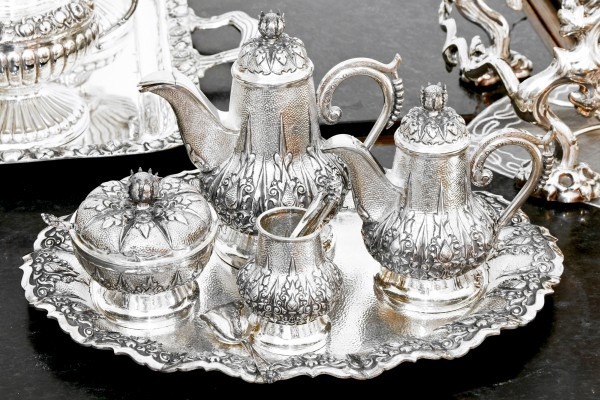 While mainly used for tableware made of silver; today, silver holloware is used for a vast selection of silver items, including silver pens and art items. We may expect silver holloware to be sterling silver, but there are items made of argentium silver or another metal plated with silver. How much does silver holloware cost? Let’s start with the metal, it is very unlikely that a coffee pot made of sterling silver holloware would cost less than a steel pot. The metal is where it all starts and is of prime importance in determining the price. Sterling silver is 92.5% silver and 7.5% other metals. The added metal is most of time copper. Argentium silver is very similar to sterling. It has a higher percentage of silver. There are two main versions of argentium silver: Argentium 930 and 965. These silver alloys include 93% and 96.5% silver, respectively. For more information these silver alloys, you may visit our sterling silver and argentium silver pages. When we look at silver plated items, it is impossible to give a percentage without any inspection. The appraisal will depend on the silver percentage, its thickness, and plated metal inside, besides other factors. This is why a judgement on silver plated items should be more discussed “per item” basis. When we’re shopping for a anniversary gift, it’s good practice focus solely on sterling silver items. 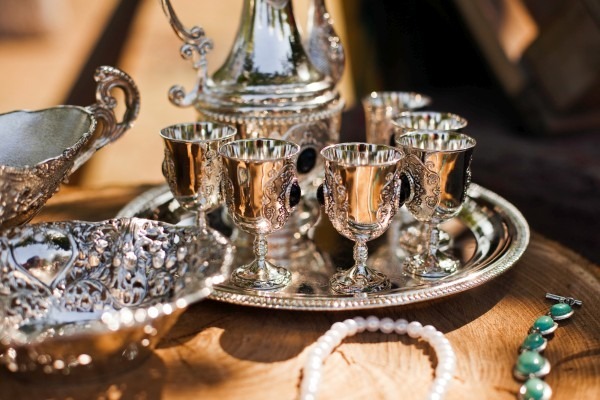 Sterling silver is easily definable, thus understandable from a buyer’s perspective. These items are more “sellable” as it’s well-known and easier to make an appraisal of. Another factor would be the weight of the item and percentages of precious metal used to produce it. We would expect a lighter sugar bowl to cost less than a heavy one as it is made of a lesser amount of silver. Manufacturer’s brand and design effects not only your buying price, but also your selling price, if you ever decide to sell the item. Price goes even further with limited-edition series. Silver candlesticks have their place in every fine designed table. They go perfectly with table with silver flatware and utensils. They may also be combined with ceramic tableware. You have a wide selection of designs from classic to modern. Amazon offers a very nice range of silver candlesticks ready waiting for you. No doubt, you can find a good choice to the taste of her. A last note, if she is into old items, you may pick a rare antique piece from Ebay or other marketplaces. Silver napkin ring is another good choice for the elegant lady. Every woman wants to impress her guests in the home and especially at the dinner table. Napkins are not usual pieces on every table. Only a table crafted with exquisite taste would have them. Napkins waiting for guests nicely prepared with napkin rings are the perfect greeting to an impressive table. 16 years is not a short time where divorces are so wide spread. The 16th year anniversary should certainly be celebrated and should be remembered forever. A silver picture frame with an anniversary photograph is a perfect memorabilia. You may also get creative by including a collage for special moments and create a unique precious gift. In the digital age, using fountain pens is a clear sign of taste. Not everyone uses fountain pens because not everyone finds the necessary work worth it. If your gentleman uses fountain pens, he will truly appreciate a silver fountain pen combined with an inkwell. A hip flask is not only something you carry along. You can keep it your drawer at your home office. A silver flask is a nice gift for a gentleman who would like precious gifts which he may actively use. When a man dresses up for the occasion, it is different than a woman. Women have long hair-short hair, jewelry and a wider selection of dresses and shoes. A man’s choices are limited. Two important areas are watches and cuff links. A pair of silver cuff links with initials on them or the birthstone of the gentleman is a perfect gift for every occasion. A pair of silver vases are a good choice for the loving couple. They will always shine in the living room. They also find their place on a dinner table elevating the atmosphere. Silver candelabra could be the prime player on a table. Today, you have many different designs. Make sure you check silver candelabra decorated with sparkling jewels. Silver lantern is the perfect gift for the couple who likes silverware and light-giving items. It will enlighten nights with style. You can find many different designs ranging from classic to modern to more artistic items. How to create unique silver gifts? The best 2 ways to create the unique silver gift is the to combine a gemstone and use an engraving. If you want to specialize to your gift, a excellent way is to add a gemstone to it. You can choose to combine a gemstone with all of silver items. But which gemstone are you going to pick? A good answer for this question, is the gemstone which is the birthstone of the receiver. You may refer to this post for birthstones of every month. Another good decision would be to choose a gemstone with the favorite color of the receiver. Again, you may have a look at the article mentioned above for an appropriate gem. A different approach could be choosing a gemstone with a certain metaphysical effect such as healing powers, increasing concentration or bringing wealth. If you really want to create an unforgettable gift: personalize your gift for that special man, woman or couple! Give that unique gift which is made for no one else. How can you create a unique silver gift? A simple yet effective way is to have the receiver’s initials or name engraved on the gift. For example, think of a jewelry box with engraved initials or a silver fountain pen with the receiver’s name on it. If you are giving a gift to a couple, you know closely, you may think about a special memory they had together and refer to it. For instance, you may choose to have their first photograph with each other or their wedding photo engraved on a silver plate with the date and place underneath. You may also consider love quotes and poemes for engravement. By going that extra mile, you’ll be sure to guarantee to create that surprise effect with a wonderful smile. Nevertheless, the true power of the gift is, remembering and letting them know that you genuinely care for them. 6 Super Silver Gift Ideas Which She Will Never Forget: What Is The Best Silver Holloware Anniversary Gift For Her?